When it comes to remakes and reboots, it is hard to improve on the original film. This achievement is almost impossible when the feature in question is critically acclaimed – this is the goal for Neil Marshall’s latest film, a reboot of Hellboy. Starring David Harbour and Milla Jovovich, the 2019 version sees the eponymous character (Harbour) take on Nimue (Jovovich), a sorceress who wants to wipe out humankind. Originally a threequel to be directed by Guillermo del Toro, the renowned filmmaker refused to work on the project without his own script. With that, he left the development, along with leading man Ron Perlman – leaving the project in limbo. It eventually became an ambitious albeit questionable reboot. The film dabbles along an almost identical narrative to the 2004 version – Hellboy being inspired by evil to embrace his ‘destiny’ by unleashing Hell on Earth – but that’s where any similarities stop. While del Toro’s rich visual style emphasises on the colour and almost lavish unfamiliarity of the supernatural, Marshall’s grittier, gruesome take delivers an unnecessarily violent thriller with gothic undertones. In addition, the CGI-laden fight scenes are just dull and end in the same predictable way – a blood-splattered mess. This hit-and-miss approach is not improved by the emphasis on the film’s British settings and characters, ranging from stuffy hunters and Cockney gun-wielding shopkeepers to the blunt Trevor Bruttenholm (a hammed-up Ian McShane). Thanks to Andrew Cosby’s lacklustre dialogue, Harbour’s performance is to be expected – unrefined and imposing. He depends on his character’s physicality to drive his performance, so Hellboy’s rebellious nature lacks the necessary charm that captivated audiences almost 15 years ago. What is more annoying than Jovovich’s boring Nimue is the limited screentime of the interesting supporting characters Alice (American Honey‘s Sasha Lane) and Daimio (Daniel Dae Kim) – especially considering the latter’s casting controversy. 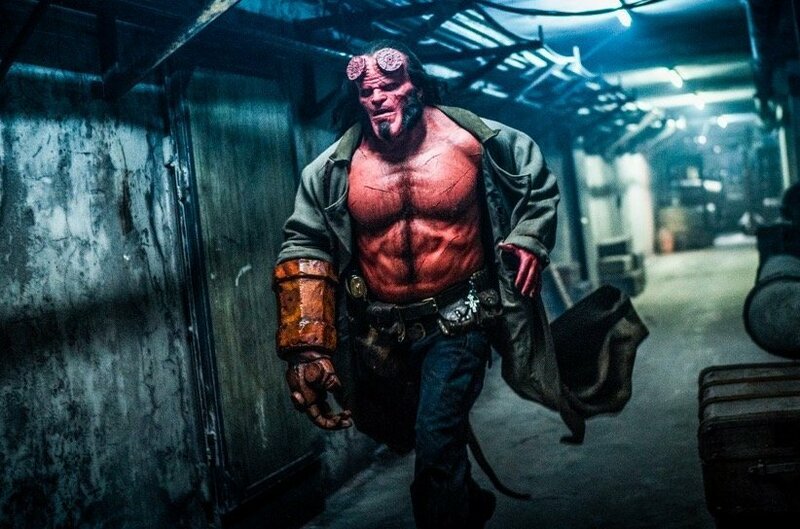 Even during the development stage, Hellboy 2019 was at a disadvantage. Drawing its inspiration from a number of comic books, the end result has to manage a lot of elements so it ultimately loses its creative direction. Along with a director known for his horror filmography, the project is more likely to aggravate fans of the 2014 version rather than win over new ones. Overall, the latest live-action version of Hellboy suffers without del Toro and Perlman as the whole piece is like its eponymous character – chaotic, senseless and without direction.